BiXPower Super Large High Capacity 336 Watt-Hour Light Weight Lithium Battery with BiXPower DD90X Multi Voltages DC Power Converter Combo Kit. FYI: This battery capacity is 336 Watt-hour, most laptop internal battery capacity is only around 50 Watt-hour ~ 75 Watt-hour. 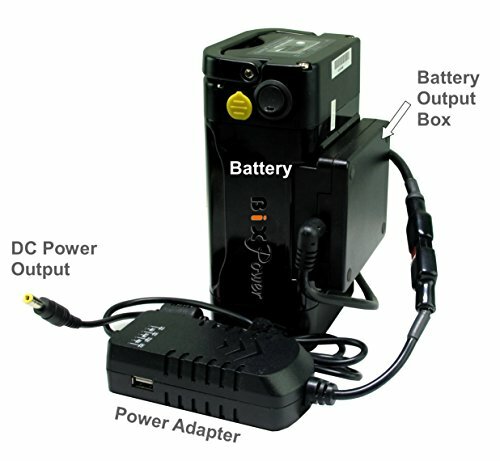 The battery pack comes with a 366 Watt-hour battery and a multi output voltages DC to DC power converter that can convert and stabilize the battery output to many different voltages, such as 12V, 15v, 16V, 18.5V, 19.5V, 24V, which work for many different laptop/notebook computers or other devices. A 5V USB port on the DC power adapter can provide 5V max. 2.1A power, which can be used to charge and power many tablets such as iPad. BiXPower Super Large High Capacity 336 Watt-Hour Light Weight Lithium Battery with BiXPower DD90X Multi Voltages (12v/15v/16v/18v/19v/24v) DC Power Adapter Combo Kit. BiXPower DD90X DC to DC power converter that can convert battery output voltage to 12V/15V/16V/18.5V/19.5V/24V at your selection. Maxiumu output from DC power adapter is 90W. The package also includes 12 interchangeable connector tips that can plug on the output end to form different connectors. This battery works for many different laptop/netbook/tablet computers and other electronic devices.